United States (TexasTribune) – The same day the U.S. Supreme Court declined to fast-track a decision President Donald Trump wanted on the fate of the nation’s “Dreamers,” a federal district judge granted undocumented immigrants a separate, temporary victory. U.S. District Judge Philip S. Gutierrez on Monday issued a temporary injunction that prevents Department of Homeland Security officials from revoking Deferred Action for Childhood Arrivals, or DACA, status from young, undocumented immigrants without notice or explanation. The department must also give DACA recipients an opportunity to respond, according to the decision. DACA, which Trump has threatened to let expire in March, is an Obama-era program that awarded renewable, two-year work permits and a reprieve from deportation proceedings to certain undocumented immigrants who came to the U.S. as children. Monday’s ruling out of California in IEIYC & Arreola v. Nielsen also grants class-action status to future defendants, which means that similar cases — including those in Texas — must follow the judge’s guidelines, said David Hausman, an attorney with the American Civil Liberties Union’s Immigrant Rights Project. 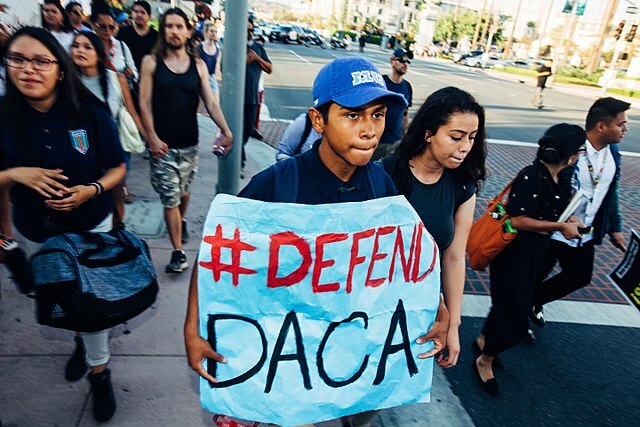 The ACLU and the ACLU of Southern California filed the suit on behalf of the three DACA recipients in California who alleged that their status had been revoked despite being in full compliance with the law. The case could now return to Gutierrez’s court for a full hearing, or the government could appeal the injunction. Officials with U.S. Immigration and Citizenship Services, which administers DACA, did not immediately respond to a request for comment. The lawsuit alleges that the Department of Homeland Security illegally and arbitrarily revoked DACA permits based on unproven allegations, or low-level offenses that don’t disqualify DACA recipients, the ACLU said. In some cases, Hausman said, the government “notices to appear” before an immigration judge that DACA recipients receive — the first step in the deportation process — only say they’ve been charged with “unlawful presence,” something that is “common to all DACA recipients.” They offer no specifics. In his ruling, Gutierrez wrote that it was clear this issue would affect future DACA recipients, not just the plaintiffs. Hausman said Gutierrez’s ruling complements the U.S. Supreme Court’s Monday decision by giving “Dreamers” an added layer of protection amid the uncertainty around the future of DACA. Trump announced in September that the program would end early next month, but two separate federal court rulings have stopped the phase-out of the program from happening. Monday’s U.S. Supreme Court decision means the case will go through the normal appeals process, which could drag on for several more months and afford more DACA recipients the chance to renew their two-year work permits. But immigrants and their supporters were less welcoming of another court ruling that emerged out of Washington this week. On Tuesday, the U.S. Supreme Court overturned a lower court’s ruling that immigrants in prolonged detention should be allowed a custody hearing to determine if they are eligible for release. Two lower courts had ruled that immigrants should be afforded a hearing after being detained for six months, according to an ACLU news release. But Justice Samuel Alito said that interpretation was too broad and that the reading of the current law authorizes detention “until the end of the applicable proceedings,” The Washington Post reported. Justices instead sent the case back to the appeals courts to determine if the practice of holding immigrants for an extended period violates the U.S. Constitution.